This is the result of our search? Please. 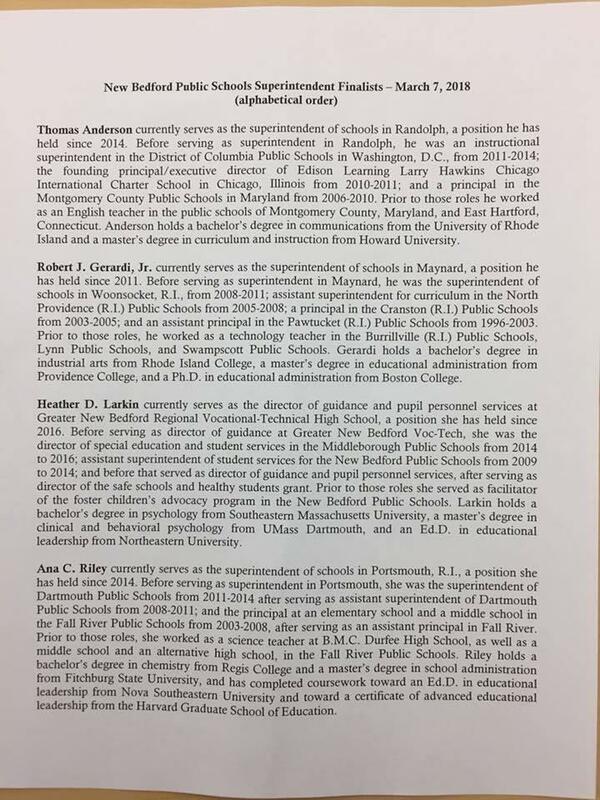 I know it's guilt by association, but I don't think the recent hiring of Randolph administrators is working out that well. As much as I hate to admit it, it might be Mike Shea time again. The district needs to hire a well respected chopping-at-the-bit Assistant Superintendent. Surely the search team can come up with two or three names. I hear Normandin is a chaotic mess. I hear the middle schools are terrible! Bring the parents in and hold them accountable for their child's behavior. It starts at home! Hear same at Keith. Heard principal is in locked down in the principal's office and hardly ever seen. This is how the school committee should handle the superintendent and assistant superintendent's search and hiring program. The superintendent has the responsibility for the entire district with his or her responsibility focused mainly on the middle and high school level. The assistant superintendent is actual a superintendent-in-waiting and is mainly focused on the elementary grades. What does this structure do? It focuses on specific grade levels and allows for a greater hands-on approach to management and accountability. It also creates a succession program which is common in industry and successful companies. If the school committee is wondering where any monies is coming from if at all needed, then the school committee has no idea to what is going on in our schools or at PRAB. The discipline article in the Standard Times was as hilarious as it was sad. Teachers have been complaining of discipline problems and the handling of such problems for at least 15 years. Now that Durkin is leaving these issues will come under a spotlight, as the school committee and the Standard Times will realize they have been duped. Shame on school administrators at the school level and those at PRAB for the past 15 years for not being upfront with credible information. The teachers know and report discipline issues on a daily basis. Now that a new Superintendent and Assistant Superintendent will be hired, for some reason it has become critical for the Standard Times and principals to call-out the past and present discipline situation. But it has to come out because the new team will highlight the issue in their first report to the school committee, at which time Durkin and Defalco will be long gone. If the results are a surprise vote in a new school committee, and if the SC collectively shake their heads as if they have be hoodwinked, vote in a new school committee. They are not holding the PRAB team accountable, and that needs to stop. Discipline problems begin at home and carry over into the public schools. A curriculum needs to be established and implemented at the pre-school and kindergarten levels and continued through the 6th grade with remedial work in 7th and 8th if needed. The operative word is “curriculum,” not some knee jerk response to impress the data-gathers at PRAB. Just a reminder, the discipline issue was brought to the forefront for the past 2 years. As far as the SubStandard Times, the bigger that made me laugh, not in a funny way, was the exits of many great teachers and staff. Where were they when that issue was brought up the past 2 years as well. I, in my opinion, believe that the accountability piece was strengthened with 2 new committee members. You make several great points here and would love to hear your thoughts and getting this message across strongly. To be honest with you Chris, I have given Principals and Assistant Principals recommendations on how to begin the process of working positive student behavior into schools, ideas to create environments to turn-around students with poor behaviors, and options to engage parents or caretakers and the role that they can play in encouraging and helping stop ongoing student behavior problems. It is not easy to convince anybody to push through an agenda that isn't theirs, may create more work initially, or is different than anything that has been done. God knows it may require administrators to leave their bunkers, and believe it or not teachers to buy in. Let me just give you one idea. Open House occurs too long after the school year begins, and by that time students with poor behaviors have already been established, and is expected by classroom students. Open House would be better served if it occurs before the school year begins. In order to do that though and engage all participants, a program needs to be created that lays out a strict guidelines of do's and don'ts and the disciplinary actions that be taken by the district for repetitive offenders. In the terms that educator lingo; a contract between teachers, administrators, SC members, and parents or caretakers. Remember our old Kieth Middle with Mr Desrosiers and Mr Teixeira and the great staff? Durkin ruined the culture and climate of our schools and her choices of personnel were a disaster rubber stamped by the school committee and Mayor Mitchel. As I read the articles in the Standard Times about the Superintendent interviews one must ask the question, “Is the School Committee thinking “out of the box?” I am not getting the feeling that they are. Another words, I am not impressed about what I am reading. If we continue to lob these beach ball questions only to receive feel good answers, how is anything going to change. I find it funny that teachers at meetings are told to think out of the box, but when it comes to our expectations of the top positions, the school committee lacks the confidence to drill down to specifics; the drivers to really create change. The same old, I'm coming back to my roots or the district is up and coming or really good things are happening here are not what we need to hear. Concrete solutions to real urban issues with personal data that proves a candidate credibility is what is needed. The new Superintendent has the opportunity to be a change agent in the school district. It will take time to fix the damage that has been done over the past five years, and the School Committee must realize this. One of the first things that should occur is the acknowledgement of mistreatment of teachers and certain administrators from the School Committee. With zero backing of the School Committee, the Mayor, and Superintendent and Assistant Superintendent the number of quality teachers and school administrators that have either left or retired early is staggering. And they are not coming back. All that was needed for jettisoned personnel to remain in the system was support and encouragement. Can a pledge be made not duplicate the same mistakes again?